West Deptford's Corey Fischer wrestles Aiden Barr from Haddonfield High School to win the South Jersey Group 2 Championship at West Deptford, Friday, February 8, 2019. Corey Fischer put the finishing flourish on West Deptford’s first South Jersey title in wrestling in nine years with a pin in the penultimate bout. But as far as the Eagles’ star 160-pounder is concerned, his team took irrefutable command against arch-rival Haddonfield when 195-pounder Tasir Money rallied in the final seconds for a victory in the second bout of the South Jersey Group 2 championship match. West Deptford wrestlers celebrate at West Deptford High School, Friday, February 8, 2019. West Deptford won the South Jersey Group 2 championship. 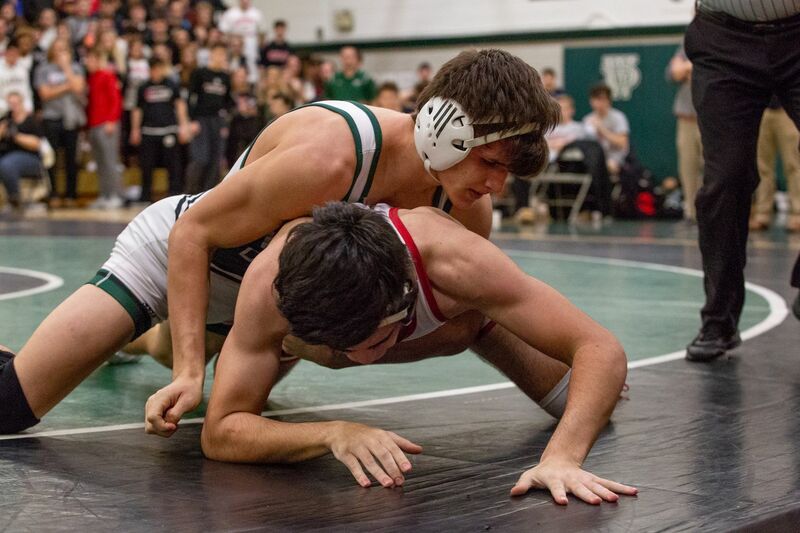 West Deptford (24-4) won nine of 14 bouts in securing its fourth sectional title and first since 2010, when current coach Nick Iraldi was a senior captain for the Eagles. The match pitted two of South Jersey’s fiercest rivals, as the schools regularly square off in Colonial Conference and sectional championship competition on the football field and in multiple other arenas. Fischer took the mat with West Deptford holding a 26-20 lead but with Haddonfield riding some momentum after a pin by Declan Skelly at 145 pounds and a technical fall by Luke Benedict at 152 pounds. But with just two bouts to go, Fischer knew a victory of another kind would clinch the bout. “I had confidence in myself and in my teammates,” Fischer said. Fischer sent the white-clad West Deptford student section into a joyous celebration with a pin that stamped an exclamation point on the team victory. “That was just a rush of adrenalin,” Fischer said. The Eagles got technical falls from A.J. Monahan at 113 pounds and Jake McConville at 126 to gradually build their lead to 26-6 after nine bouts. But Money scored the key victory. When the teams wrestled Jan. 30, Money had lost a 7-6 decision to Haddonfield’s Mike Carey. This time, Money fell behind Carey 4-0 but rallied and won in dramatic fashion, with a takedown and back points to snap a 5-5 tie in the final five seconds. “This has to be one of the greatest feelings I’ve ever had,” Money said. 182: Gavin Shields, WD, d. Nick DiNoia, 6-3; 195: Tasir Money, WD, d. Mike Carey, 9-5; 220: Gabe Klaus, H, d. Hayden Holmes, 3-1; 285: Matt Pinskey, H, d. Shane Kelly, 2-1, OT; 106: Justin Monzo-Hull, WD, d. Brian Schlitt, 5-1; 113: A.J. Monahan, WD, tech. fall, Blaise Hendrix, 21-6 (5:30); 120: Nate Schultes, WD, d. Nick Palmer, 3-2; 126: Jake McConville, WD, tech. fall, Bobby Hahn, 24-9 (5:14); 132: Yom Stefney, WD, d. Ben Siok, 13-2; 138: Ryan Bolletino, H, d. Steve Brittingham, 2-0; 145: Declan Skelly, H, pin Ian Cori, 1:42; 152: Luke Benedict, H, tech. fall, Gavin Gismondi, 17-2 (5:40); 160: Corey Fischer, WD, pin Aidan Barr, 3:37; 170: Cody Thurston, WD, win by forfeit.